Finally, the much-promised and much-awaited ferry service between the Yucatan and the United States seems to becoming a reality. It’s not here yet, but serious progress has been made. A few weeks ago, the investors in this project asked for input and were happy to get over 2000 responses. Below are some of the questions that were posed and the answers from the current investor group. One very large remaining question is the US port and Yucatan port. 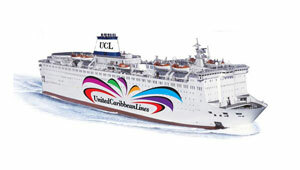 United Caribbean is still in negotiations with the ports and is therefore not able to declare the ports at this time. As soon as the ports and confirmed, we will update you with that information. We will have a nice introductory offer for our first time users when we start. We will also have discounts, which will be based on seasonality and time of travel. We intend to make it possible for those customers who use the ferry regularly to get the best prices, best discounts and the most benefits. I will make sure that people who responded to our questionnaire or who send me their email addresses now will receive the introductory offers first as an appreciation for their help with the surveys. We hope to be ready to begin bookings in October 2014 for April trips. Those offers will include upgrades, special rates on cars and goodies on board. We expect the round trip fare for the ferry, including a cabin and all food and entertainment on board, to start at $350 USD per round trip. Cars will probably cost $95 USD one way. Again, frequent users will pay lower rates. We have even discussed the idea of super special rates by buying ticket books in advance that will provide the lowest possible rates, guaranteed space on certain dates, and the lowest car rates. 1. Can we bring small pets? Yes. 2. Can I bring extra stuff for my residence in Mexico other than luggage and what fits in my car? Yes. We will have special personal cargo bins that can hold up to 1000 lbs, including bulky items like bedding, appliances, even a refrigerator. We will rent the bins one way for $95 USD. 3. Can I bring an RV? Yes. 6. When will the web site be up? It is already being prepared. We will have a preliminary site up by the end of August that will have show schedules and prices. We will send out an email to everyone when the site is ready. 7. When will bookings start? Our target is October 2014. 8. When will first voyage be? Our target is April 2015. 9. Will this be a year-round service ? Yes. We are planning 2 round trips per week between the U.S. And the Yucatan, 52 weeks a year. 10. How will we be able to book? Online thru the website, and through major online travel sellers like Expedia, Orbitz, etc. Posted: July 29th, 2014 under Yucatan News.